If you play a lot of golf in the UK in the winter (or in the spring, summer or autumn come to think of it) you're bound to get a lot of wear out of weatherproof clothing. It makes sense, then, to put some time and effort into choosing the right gear. With the selection and excellence of today's raingear, rain of the golf course should no longer mean a long walk to the car. There is no doubt that buying waterproofs and raingear today is a wealthy investment, however this is one essential piece of golf equipment. So start saving and read the following information on raingear and waterproof clothing to help you understand what it is you should be looking for. As its name suggest, this type of raingear is totally waterproof. Second to none, when it comes to heavy rain waterproof gear will insure that you still completely dry underneath your jacket and trousers. Goretex is the most common material used to waterproof gear and is far and away the most effective waterproofing fabric there is. It uses a porous membrane either between fabric layers or laminated to a layer. The membrane openings are small enough to exclude liquid water, but large enough to allow water vapor and air to circulate. This can be an advantage when you are playing in periods of extended rain. To get a 100% waterproof suit or item you may need to reach deep into your wallet, but there is no substitute. When buying a waterproof suit or individual jacket or trousers you should try and find outerwear that offers a guarantee. The top waterproof manufacturers should offer a three-year waterproof guarantee with their clothing and this is worth the extra investment. Commonly mis-interpreted as waterproof, rain or showerproof outerwear is the secondary form of defence against wet weather on the golf course. Rainproof gear is not made using Goretex and is typically made from a fabric that is treated with Teflon. This means it tends to keep water from penetrating for short periods, but allows air through and may wick moisture through during long exposures. Slightly more lightweight and less expensive than a waterproof jacket, it is ideal if playing in short showers, but will not guarantee to keep you dry in longer showers. Windproof clothing does exactly what it says, protects you against wind. Its technical construction is developed to produce materials which prevent the wind from passing and remaining highly breathable in the meantime. It is the most efficient choice when your playing in cold and windy conditions, but is rarely waterproof. 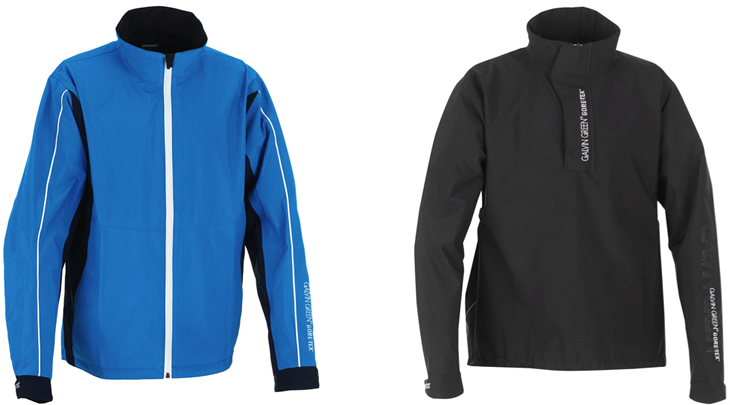 Some windproof items are also treated with Teflon to offer a slight degree of water resistancy, but they are not designed to be worn in wet weather. Not as expensive as either waterproof or rainproof gear, they are a warm option for cold weather. Comfort: the jacket must be comfortable to wear. Playability: you must be able to swing freely with the jacket on and not feel that it is restricting your swing. Jackets can have a full length zip, a collar zip or just be a slip-on jacket. Usually it is just a matter of preference for zips, however full length zips do tend to cause the jacket to stick out when you are crouching for a putt or chip, which can frustrate players. Features: pockets, hoods, inside lining, cuffs, adjustable qualities are all features that you may want to consider in your jacket. The 21st Century look in rain or bad weather is definitely the short-sleeved jacket. 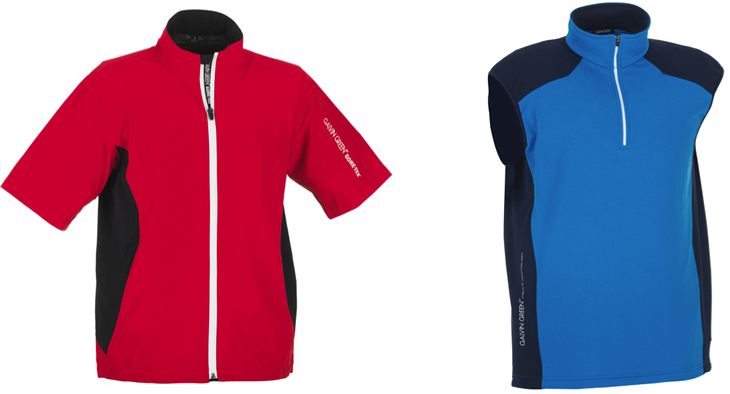 Usually a thinner version of the full jacket, its short sleeves offer you a more breathable, unrestricting alternative to the longer sleeved jacket. Popular with professionals, especially in warmer climates, this type of jacket has sleeves that end at your elbow leaving your lower arms uncovered. The idea being that the longer the sleeves, the more limiting the jacket is to your arms in your swing. Make sure when you buy a short sleeved jacket that is the type of waterproofing that you want, many shorter jackets may only be rainproof or windproof. Many longer sleeved jackets also offer removable zipped sleeves to allow you the option of long sleeved, short sleeved or sleeveless jackets in bad weather. However this type of fleixble jacket may cost you slightly more than a standard jacket. The weather-gear vest is a lightweight sleeveless jacket that is easily slipped over any outwear you might wear out on the golf course. Useful for wearing in cold or windy weather, a vest is not the best option in rain for obvious reasons. Worn by many for looks alone it is an attractive piece of golfing clothing but does not offer the protection of a thicker, longer jacket. Often forgotten about by many golfers, trousers are just as essential as any jacket or weather top. When wet weather sets in, your lower half can quickly dampen when walking through rough grass or from water lying on the fairways. Almost all waterproof or windproof trousers will have an elasticised waistline so that they can be easily worn over your golfing trousers. Some trousers will have slits instead of pockets so that you can reach through into your original trousers and not have to wait on a tee transferring tees and pencils into your waterproof trousers. You should always try and buy trousers that are longer than your usual trouser leg so that they cover your golfing trousers and also lie over the collar of your golf shoe, preventing water gathering around your shoes or trouser leg. Most trousers offer zips and poppers at the bottom of the legs to make it easier to take them on and off and fit your ankle, this is worth looking for. It is also a good idea to buy your waterproof trousers as part of a set along with a jacket; this will not only save money but also insure that it is the same design and material as your jacket. Keeping your extremities protected in the worst of the weather is essential so investing in solid waterproof protection for both your head and hands will ensure you stay dry and warm that will drastically improve your performance when conditions get tough. A valuable tip for caring for your waterproofs is to remove them from your bag after you use them and wash them. It is easy to forget about your jacket or trousers after you wear them and the rain has spoilt your round, but it is important that you take them out of your bag. They will dry quicker and wont smell and pollute your bag. Washing them is a good idea, not only to keep them clean, but tumble drying certain waterproofs actually helps them. The heat makes the waterproof material tighter and more water resistant but don't guess - read the care label like your Mum told you to! 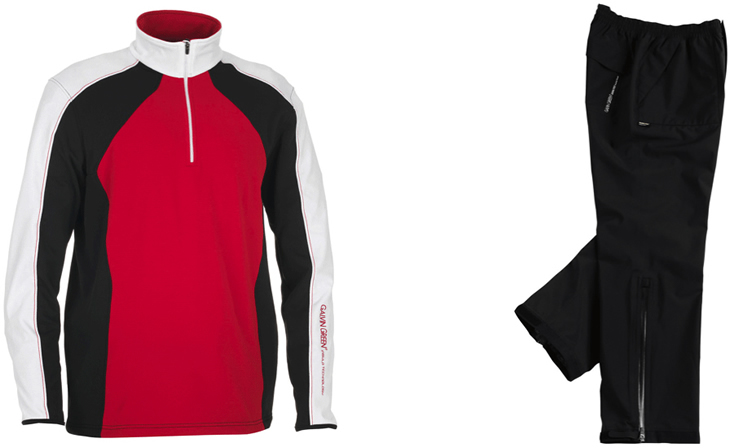 Range has been designed to enable the golfer to ‘Layer Up’. UK MD reveals new Interface layer that will be used in Ryder Cup. Scandinavian style combines with Primaloft technology. AW17 collection utilises Japanese performance tech.